Do You See a Rabbit or a Duck in This Drawing From 1892? An image published in a German magazine about 124 years ago is turning heads this week. 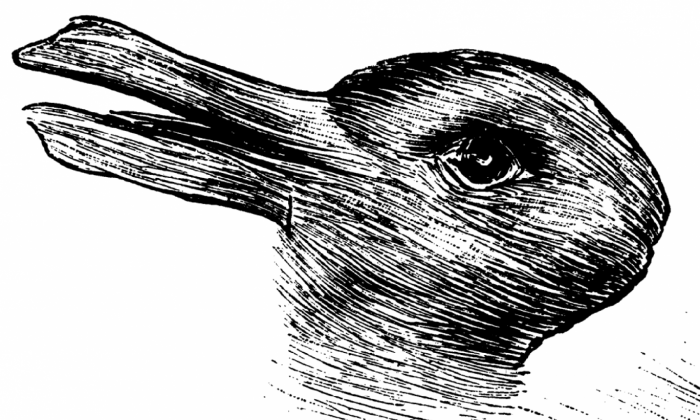 The picture, published in 1892, shows a drawing of a duck-rabbit hybrid, and it is supposed to be a psychological test. It was later made famous by U.S. psychologist Joseph Jastrow in 1899. The Daily Mail reported on Jastrow’s findings, and he said that the speed in which someone sees each animal—the bunny and the duck—is an indicator of one’s creativity level. He used the illusion to determine how people “see” with their brains as well as their eyes. His research suggested that more creative people can switch between the duck and the rabbit at ease. The faster one does this, the quicker one’s brain works, he said. One possibility is that most individuals, regardless of handedness, tend to scan from left to right. However, the theory linking one’s creativity level and one’s ability to switch between the rabbit or duck might not be all that legitimate. A study published by the University College London stated that the figure “is very biased towards the duck.” It found there were nearly two and a half times as many duck responses as rabbit responses. “Analysing the reasons for that are not easy given the present data, but one possibility is that most individuals, regardless of handedness, tend to scan from left to right,” the study reads. It notes also that while “the duck can be seen as very many different types of bird, the rabbit is far more restricted.” The study then says that the angle at which one views the image is also noteworthy.